Stick insects are amazing animals. They have the most incredible camouflage and their shapes and colours make them some of the most difficult animals to spot in the wild. Australia has over 100 species of stick insects, with some of the world’s largest and most spectacular species occurring in the northern parts of this country. A Crowned Stick Insect - one of many Australian species. 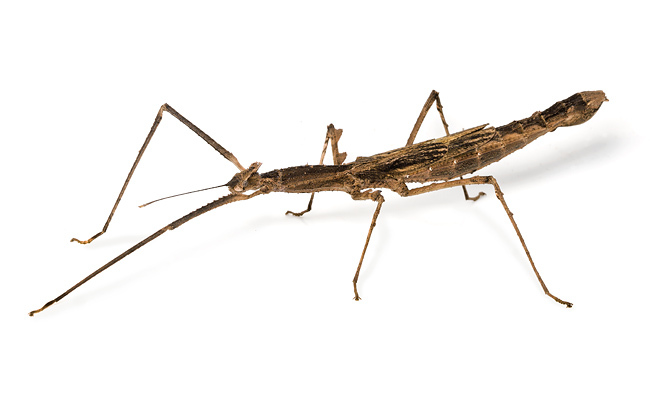 Believe it or not stick insects actually make great pets, particularly if you are looking for something with built in education – it is a great way to learn about insects and their life cycles. These harmless fascinating creatures take up very little space, and are much cheaper to feed than conventional pets. They are relatively easy to keep, but do need to be set up in appropriate housing. Stick insects like to climb and normally live within the branches of the various trees and shrubs. An enclosure should take this into account, and be taller than it is wide. Pop-up mesh enclosures such as those available in our Minibeast Wildlife Bug Shop are ideal for stick insects. Stick insects feed upon leaves, and while some species are very fussy about the species of plants they feed on, many feed happily upon gum and wattle tree foliage. Some will eat the foliage of other backyard plants such as roses, Lilly-Pilly and Guava. They require fresh leaves at all times, so fresh cuttings of these plants should be maintained within a vase or jar inside the enclosure. It is very important that small stick insects cannot fall into the water as they will drown. The best way to avoid this is to poke the plant stems through some form of lid or cover. Although stick insects get some water from the leaves they eat, they still need to drink. In the wild they get additional water from dew drops and rain which collect upon the leaves. Lightly misting the leaves around the insects with a spray bottle is an excellent way of providing this. It is very important to make sure that any bottle used for this has never contained chemicals. Stick insects are invertebrates; they have no internal skeleton instead having an outer skeleton (exoskeleton) which holds them together. To grow, they must emerge from the old exoskeleton and as they do become larger before setting hard again. This is just one of the fascinating things which can be witnessed when keeping these animals. A female Spiny Leaf Insect - one of the most popular species. 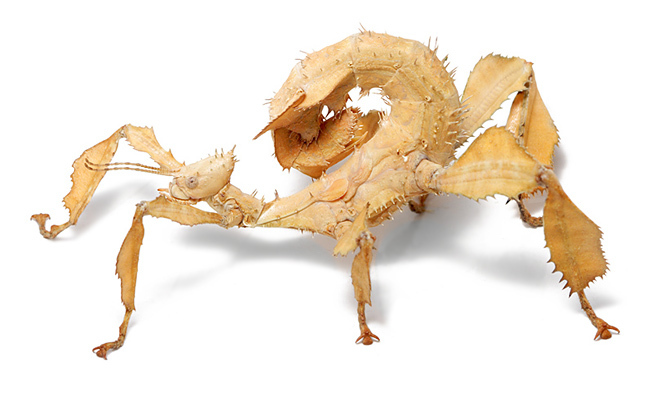 One of the most popular stick insects kept by enthusiasts around the country is the Spiny Leaf Insect (Extatosoma tiaratum) from northern Australia. This remarkable insect is more like a dry leaf than a stick and is covered with spines. This amazing species is just one of many we have available in our Bug Shop, and we supply Care Guides for all the species we breed and sell. If you want more detail, our award-winning book 'Bugs Alive - A Guide to Keeping Australian Invertebrates' is a must have. Information to help you solve basic husbandry problems and associated health issues. • My stick insect isn’t eating the leaves I give it. • My stick insect has lost a leg - will it grow back? • My stick insect has laid hundreds of eggs, why won’t they hatch? My stick insect isn’t eating the leaves I give it. Try a different species of leaves, or even the same species form a different tree. You may also want to try putting a few different kinds of leaves in the enclosure at once to find out which species your stick insect likes best. Sometimes phasmids may be happy eating a particular species for a long time, and then suddenly go off it. This may be due to seasonal changes in the chemicals within the leaves. It is important to always be sure that you phasmids are actually eating what you are feeding them. My stick insect has lost a leg - will it grow back? Phasmids lose their limbs as a form of defence, a process called autotomy. It can grow back a lost leg if it is still a nymph with two or three growth stages ahead of it. Limbs are regenerated in stages when the insect moults. Usually, the leg reappears as a stub or tiny curly leg the moult after the loss occurred. After the next moult the leg will be fully formed but is usually noticeably smaller than the other legs. After a third moult, the leg may be very similar to the others in size and form. Adult phasmids cannot regrow their legs. My stick insect has laid hundreds of eggs, why won’t they hatch? In continuous warm conditions (22 -26°C) the eggs of most Australian phasmids will begin hatching around three months after being laid. If you allow the eggs to experience some seasonal cooling, then the incubation period will often be extended. Some eggs will enter a state called diapause where they do not continue to develop until they are stimulated by other factors. Favourable seasonal conditions such as warming and increased humidity are often the stimuli they require. Minibeast Wildlife has recorded Extatosoma tiaratum eggs hatching three years after being laid, when they experience seasonal cooling. Soaking the eggs briefly, then warming them with increased humidity is a good way to stimulate hatching for eggs over three months old. Feel free to contact us via email if you have any questions about keeping these fascinating animals.